The view from the farm of Mount Vernon in early Autumn. The manicured lawn runs up to the mansion beneath trees that stood in George’s own era. George’s great grandfather, John, actually acquired the land on which the plantation stood in George’s era, and which belonged, until is untimely death, to his admired older half-brother Lawrence. A splendid portrait of George’s adventurous younger brother, Samuel, who had the Harewood estate built just outside modern day Charles Town, Virginia, named for another of George’s brothers. Curmudgeonly Lord Fairfax was the very definition of an old school British “sportsman.” He was accompanied by George on numerous hunts and would grow fond of the young man who lost his own father at the age of eleven. Richard Henry Lee, one of George Washington’s best friends before and during the Revolution, sparked a call for independence with these words. Because Richard Henry Lee’s son married a Washington, many Washingtons in Virginia descend from the British-educated patriarch. In the 18th Century, the Lees of Virginia represented the very epitome of American aristocracy, to which young George would eventual aspire — and in some ways surpass. Behind several modern homes at Fort Belvoir, a massive military installation along the Potomac, lies the Mansion where George met the Fairfax family and was taken under the wing of both Col. Fairfax and his cousin, Lord Fairfax. George also fell in love with Sally Fairfax here and spent what he called the happiest days of his life. The precise foundations of Belvoir Manor, behind which walls young George learned the art of etiquette, dance, and love. 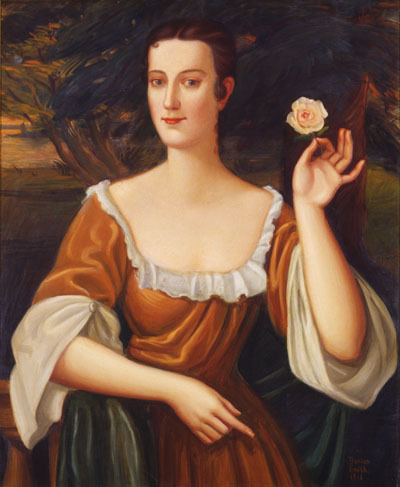 A modern depiction of an older portrait of George’s “First Love,” Sally Fairfax. George was in his mere teens when he met Sally, two years his elder. Evidence suggests she had a significant influence on the development of his chivalric comportment as well as his life-long respect for lovely and witty women. The House that Jack built near to GW’s Birthplace in Westmoreland County. George was fond of his younger brother and confided in him during the two major wars he fought in. Paraphernalia of 18th Century pastimes and fun! Clay pipes, cards, oyster shell playing chips, and plentiful supplies of alcohol. Nine pins for bowling as seen in Fredericksburg. This was not the usual lawn bowling that George would have watched or participated in. However, nine pins was popular as well up and down the East Coast in the 18th Century.